I'm combining two challenges this week, The Diva's weekly Challenge asked that we use the tangle "groovy" by Eden Hunt, and I'm using the string from Erin's Weekly Zendala Dare. 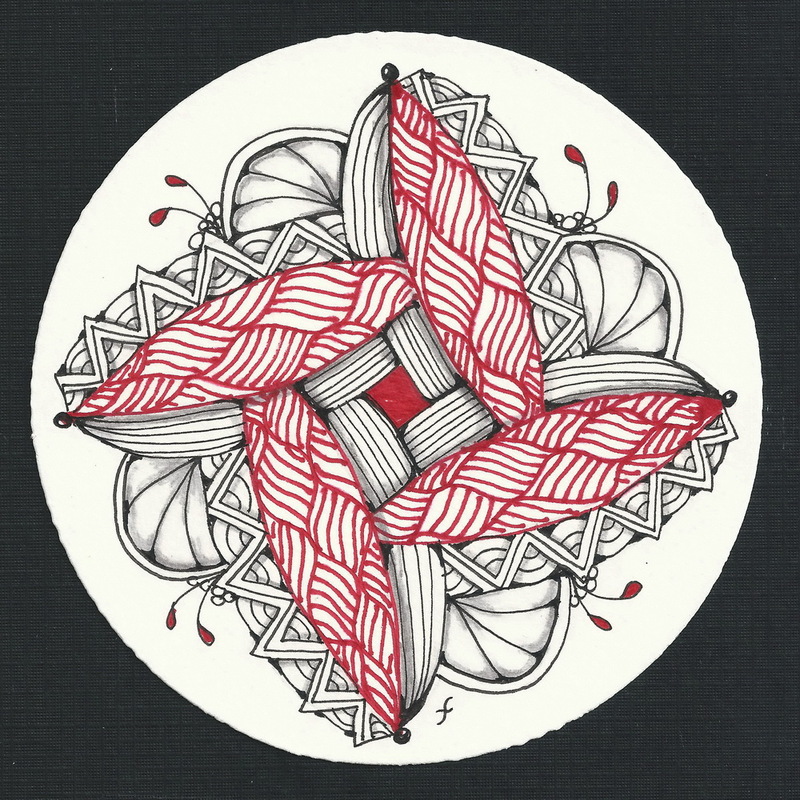 This is done on one of the blank zendalas I received from Zentangle. Groovy is the tangle in red. I also used "Gloven" and just winged it in other areas. It was fun making it all work for both challenges. This is the first time I've tangled in color, I used a sharpie ultra fine point, but I think next time I'll use a Sakura pigma 01 in color - the sharpie is still too fat. Beautiful! Golven and Groovy go perfectly side by side. Well done for doing both challenges! I did the same with last challenges (Diva's challenge #68 and Zendala Dare #3) Your work look so beautiful. Very pretty, Joni! Nice to have 2 challenges done in one. Gorgeous zendala, well placed patterns that give interest and beauty to the whole! Oh, I like the color repeated in the little sprigs on the outside edge. Perfect finish! A beautiful zendala with a perfect touch of color. I love zendala's i am very inspired by this group! I hope to make 2 this week. Gorgeous Zendala... The colour enhances it even more. The red really makes this lovely Zendala pop. Very pretty. Beautiful work. I love the red and black contrast. This is lovely Joni! I love the woven effect in the center! So Kewl!!! i love working in color - it's still new for me, but i'm really enjoying it. your design is beautiful - the red really makes it pop! The color really adds dimension. Very nice! Wow, this is beautiful, the colors are a great touch! Joni, I like that you only added one color. It makes such a beautiful contrast. Amazing job! Beautiful Zendala, Love the red! I love your zendala. Just Beautiful! I love how your red groovy pattern is linked to your little curly-q's with the red. Great idea to combine the two challenges. Gorgeous zendala. Your patterns all work so well together. Lovely - the red is just right! I really like this. The groovy and gloven do play really well together, don't they? The red is perfectly balanced with the little sprigs done too. Great work! Nice contrast. The red color makes it pop. Well done! !